As we get ready for Netroots Nation 2015, we’re taking a closer look at some of the convention’s most exciting training sessions. We’re interviewing the trainers and taking you inside some of online activism’s most popular and elusive topics. Today we’re interviewing Julie Menter of New Media Ventures, who’ll be leading Start-up Bootcamp: How to Get Your Big Idea Funded. Have a world-changing idea but need a bit of funding to get it off the ground? This session is for you. In this training, we will take you behind the curtain and shed light on what investors look for in entrepreneurs. We will use these practical lessons to help you develop the right proof points and hone your pitch. We will also discuss how to find and reach the right investors. The training will include a short presentation and lots of time for practice and questions. Q: Tell us about yourself and your experience with fundraising for start-ups. A: New Media Ventures invests in early-stage, for profit and nonprofit startups. In that position, I meet with and assess dozens of startups every month. In addition, I advise the entrepreneurs in our portfolio on how to pitch the angel investors in our network. Previously, I helped sustainability executives get support and funding for their work and developed a training workshop to help them do so. I’ve refined and tailored this training material to help startup founders get their ideas funded. Q: In your opinion, what is the most common mistake folks make when trying to secure funding for their start-ups? A: Too often, entrepreneurs view fundraising as a single transaction. They prepare a fantastic pitch and expect money to flow automatically after that. Instead, entrepreneurs should view fundraising as a relationship-building exercise. It can take a long time, and requires careful cultivation. Investors will be in your life for a long time if you do get funding, so establishing a great relationship upfront is important (and will increase your odds of getting funding in the first place). Q: What are the two most important things to keep in mind when trying to secure this kind of funding and get a start-up off the ground? A: The best entrepreneurs are incredibly persistent and great at learning. These are 2 qualities that the fundraising process will thoroughly test. Make sure you lay the groundwork before starting to fundraise (develop proof points, research what potential investors care about, get warm introductions, etc. ), make the most of the feedback you get and persist! It’s a relationship-building exercise so don’t let an initial “no” discourage you. Q: Why should folks attend your session at Netroots Nation, and how can they connect with you? A: This will be a highly interactive session. I’ll share my perspective but also invite participants to share their personal experiences and practice pitching each other. I hope this session gives you the tools and confidence to get your big idea funded. You can keep-up with New Media Ventures on our blog (www.newmediaventures.org) and on Twitter (@newmediaventure). My personal Twitter handle is @Juliepouic. To attend this training, or one of the 39 others at Netroots Nation 2015 in Phoenix, register now. 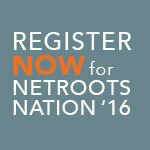 Melissa is the Director of Training and Mentoring for Netroots Foundation and New Media Mentors. She aims to use her MBA + nonprofit background to teach organizations to use new media tools strategically.